Citrus fruits were grown in southern Europe from the Middle Ages, quickly becoming popular subjects for artists. They were markers of wealth and status; emblematic (associated with the fruit of the Hesperides in Classical myth, and with the ‘apple’ of Eden in the Bible); medicinal, and thus also linked symbolically with funerals and resurrection. Striking still life paintings of citrus fruits were executed in Italy, Spain and Holland, perhaps especially during the 17th century. Weissbort’s painting is an homage to these pictures – to the work of Luis Melendez, whose paintings include not only oranges and lemons, but the round wooden boxes in which food was packed (Still life with citrus fruit, York Gallery). In Weissbort’s picture, as in Melendez’s, the wooden crate is an important element, hinting at the exotic origins of the fruit, and undercutting the different treatment they often receive in Dutch still life paintings – arranged in priceless porcelain bowls or scattered amongst silver and golden goblets. 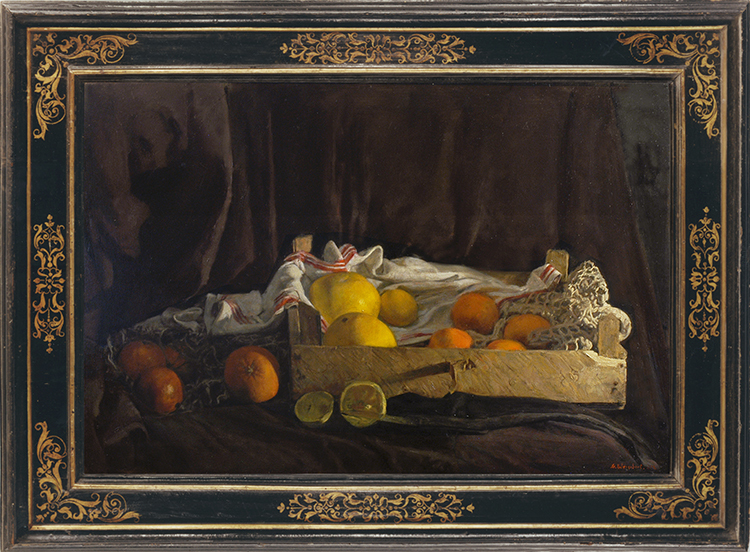 Weissbort’s crate gives texure to the work; it harmonizes with the sunny tones of the fruit, and in its throwaway nature provides an ironic contrast with the brown drapery of the background. This is a beautifully composed, sensuous still life, looking back overtly to paintings by Gerrit van Honthorst and Giuseppe Ruoppolo.